Yesterday we talked about customizing your YouTube homepage settings--and protecting your privacy while you're at it. Today, let's look at the videos themselves and how you can maximize your enjoyment of them. I'm speaking, of course, about watching at the highest possible resolution. My preferred method of viewing YouTube vids is full-screen. However, when I click the player's Full Screen button, I'm treated to rather grainy video. That's because YouTube doesn't automatically bump the resolution to its highest available setting. I have to click the resolution selector and choose it myself. I'm a busy man. I don't have time for that! 1. Go to YouTube and sign into your account (if you're not already signed in). 2. Find your username in the upper-right corner, click it, and then choose Account. 3. 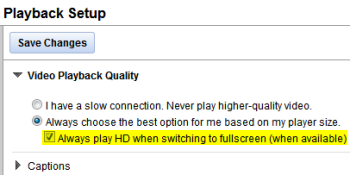 Click Playback Setup, then enable the following option under Video Playback Quality: Always play HD when switching to fullscreen (when available). 4. Click Save Changes and you're done!